This article is about water ice. 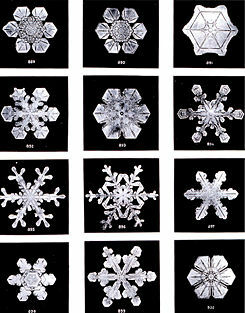 Snowflakes photographed by Wilson Bentley, 1902. Ice is the name given to water in the solid state. In nature, it is found in various forms, such as frost, hail, and glaciers. It may be classified as a mineral consisting of hydrogen oxide (H2O). Scientists have discovered 14 different crystalline forms (phases) and several amorphous forms of ice. The most abundant type of ice is made up of hexagonal crystals and may appear transparent or an opaque bluish-white color, depending on the presence of impurities such as air bubbles. The addition of other materials such as soil may further alter its appearance. Ice plays an important role in various natural phenomena, including the water cycle and global climate. In addition, it has many applications in human society. For instance, it is used for refrigeration and a variety of sports. People use ice to cool their drinks and to make sculptures and other ornamental structures. Some temporary shelters, such as igloos, are made of ice. Ice can also present a number of hazards, especially for transportation. For example, ice buildup on roads and airport runways, and icebergs in the sea can be dangerous for automobiles, aircraft, and ships. In addition, ice may build up on vehicle windows, ship hulls, and aircraft wings, making it difficult to drive or navigate safely. To counteract these problems, methods have been developed for de-icing critical surfaces of vehicles and to keep roads, harbors, and airport runways free of ice. Ice crystals on a refrigerator window. Strings of ice found in the Adirondack region of New York State. An unusual property of ice frozen at a pressure of one atmosphere is that the solid is about eight percent less dense than liquid water. Water is the only known non-metallic substance to expand when it freezes. Ice has a density of 0.9167 g/cm³ at 0 °C, whereas water has a density of 0.9998 g/cm³ at the same temperature. Liquid water is most dense, essentially 1.00 g/cm³, at 4 °C and becomes less dense as the water molecules begin to form the hexagonal crystals of ice as the temperature drops to 0 °C. (The word "crystal" derives from Greek word for frost.) This is due to hydrogen bonds forming between the water molecules, which line up molecules less efficiently (in terms of volume) when water is frozen. The result is that ice floats on liquid water, an important factor in Earth's climate. The density of ice increases slightly with decreasing temperature (density of ice at −180 °C (93 K) is 0.9340 g/cm³). When ice melts, it absorbs as much heat energy (the heat of fusion) as it would take to heat an equivalent mass of water by 80 °C, while its temperature remains a constant 0 °C. In global warming, ice plays an important part because it reflects 90 percent of the Sun's rays. Another consequence of ice's lower density than water is that pressure decreases its melting point, potentially forcing ice back into a liquid state. Until recently it was widely believed that ice was slippery because the pressure of an object in contact with it caused a thin layer to melt. For example, the blade of an ice skate, exerting pressure on the ice, melted a thin layer, providing lubrication between the ice and the blade. This phenomenon does not seem to hold true at all temperatures. For example, a block of ice, such as is commonly found in freezers, can stick to skin or other surfaces. This happens only when the block of ice is cold enough to allow the outer layer to fully harden. Most liquids freeze at a higher temperature under pressure because the pressure helps to hold the molecules together. However, the strong hydrogen bonds in water make it different: water freezes at a temperature below 0 °C under a pressure higher than 1 atm. Consequently water also remains frozen at a temperature above 0 °C under a pressure lower than 1 atm. The melting of ice under high pressures is thought to contribute to why glaciers move. Ice formed at high pressure has a different crystal structure and density than ordinary ice. Ice, water, and water vapor can coexist at what is called a "triple point." The most common triple point for water is 273.16 K at a pressure of 611.73 Pa.
Ice coating the branches of a tree. Ice forming on a wooden railing. Ice coating the branches of a bush. Everyday ice and snow has a hexagonal crystal structure. This common phase is denoted as ice Ih). Subjected to higher pressures and varying temperatures, ice can form in more than a dozen different phases. Only a little less stable (metastable) than Ih is the cubic structure (Ic). With both cooling and pressure, additional phases can be obtained, each being created depending on the phase diagram of ice. These are II, III, V, VI, VII, VIII, IX, and X. With care all these types can be recovered at ambient pressure. The types are differentiated by their crystalline structure, ordering and density. There are also two metastable phases of ice under pressure, both fully hydrogen disordered, these are IV and XII. Ice XII was discovered in 1996. In 2006, XIII and XIV were discovered. Ices XI, XIII, and XIV are hydrogen-ordered forms of ices Ih, V, and XII respectively. Besides these crystalline forms, solid water can exist in amorphous states as amorphous solid water (ASW), low density amorphous ice (LDA), high density amorphous ice (HDA), very high density amorphous ice (VHDA) and hyperquenched glassy water (HGW). Rime is a type of ice formed on cold objects when drops of water crystallize on them. It can be observed in foggy weather, when the temperature drops at night. 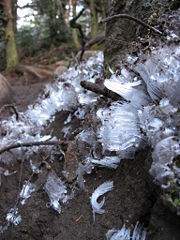 Soft rime contains a high proportion of trapped air, making it appear white rather than transparent, and giving it a density about one-fourth of that of pure ice. Hard rime is comparatively denser. Aufeis is layered ice that forms in arctic and subarctic stream valleys. Ice frozen in the stream bed blocks normal groundwater discharge and causes the local water table to rise, resulting in water discharge on top of the frozen layer. This water then freezes, causing the water table to rise further and repeat the cycle. The result is a stratified ice deposit, often several meters thick. Ice can also form icicles, similar to stalactites in appearance, as water drips from a height and re-freezes. Clathrate hydrates are forms of ice that contain gas molecules trapped within its crystal lattice. Pancake ice is a formation generally created in areas with less calm conditions. Some other substances (particularly solid forms of those usually found as fluids) are also called "ice." Dry ice, for instance, is a term for solid carbon dioxide. The following table summarizes the properties of the various phases of ice. Amorphous ice Amorphous ice is an ice lacking crystal structure. Amorphous ice exists in three forms: low-density (LDA) formed at atmospheric pressure, or below, high density (HDA) and very high density amorphous ice (VHDA), forming at higher pressures. LDA forms by extremely quick cooling of liquid water ("hyperquenched glassy water," HGW), by depositing water vapour on very cold substrates ("amorphous solid water," ASW) or by heating high density forms of ice at ambient pressure ("LDA"). Ice Ic Metastable cubic crystalline variant of ice. The oxygen atoms are arranged in a diamond structure. It is produced at temperatures between 130-150 K, and is stable for up to 200 K, when it transforms into ice Ih. It is occasionally present in the upper atmosphere. Ice II A rhombohedral crystalline form with highly ordered structure. Formed from ice Ih by compressing it at temperature of 190-210 K. When heated it undergoes transformation to ice III. Ice IV Metastable rhombohedral phase. Does not easily form without a nucleating agent. Ice VII A cubic phase. The hydrogen atoms' position is disordered, the material shows Debye relaxation. The hydrogen bonds form two interpenetrating lattices. Ice VIII A more ordered version of ice VII, where the hydrogen atoms assume fixed positions. Formed from ice VII by cooling it beyond 5 °C. Harvesting ice on Lake Saint Clair in Michigan, circa 1905. Ice has long been valued as a means of cooling. For instance, in 400 B.C.E., Persian engineers had mastered the technique of storing ice in the middle of summer in the desert. The ice was brought in during the winters from nearby mountains in bulk amounts and stored in specially designed, naturally cooled refrigerators, called yakhchal (meaning ice storage). Each such structure was a large underground space (up to 5000 m³) that had thick walls (at least two meters at the base) made out of a special mortar called sārooj, composed of sand, clay, egg whites, lime, goat hair, and ash in specific proportions, and which was resistant to heat transfer. This mixture was thought to be completely water impenetrable. The space often had access to a Qanat, and often contained a system of windcatchers that could easily bring temperatures inside the space down to frigid levels in summer days. The ice was then used to chill treats for royalty during hot summer days. Until recently, the Hungarian Parliament building used ice harvested in the winter from Lake Balaton for air conditioning. Icehouses were used to store ice formed in the winter to make ice available year-round, and early refrigerators were known as iceboxes because they had a block of ice in them. In many cities it was not unusual to have a regular ice delivery service during the summer. For the first half of the nineteenth century, ice harvesting had become big business in America. New Englander Frederic Tudor, who became known as the “Ice King,” worked on developing better insulation products for the long distance shipment of ice, especially to the tropics. The advent of artificial refrigeration technology has since made delivery of ice obsolete. Ice surfing on the Żnin Small Lake. Ice also plays a role in winter recreation, in many sports such as ice skating, tour skating, ice hockey, ice fishing, ice climbing, curling and sled racing on bobsled, luge and skeleton. A sort of sailboat on blades gives rise to iceboating. The human quest for excitement has even led to ice racing, where drivers must speed on lake ice while also controlling the skid of their vehicle (similar in some ways to dirt track racing). The sport has even been modified for ice rinks. When the outdoor temperature stays below freezing for extended periods, very thick layers of ice can form on lakes and other bodies of water (although places with flowing water require much colder temperatures). The ice can become thick enough to drive onto with automobiles and trucks. Doing this safely requires a thickness of at least 30 centimeters (one foot). U.S. Coast Guard icebreakers near McMurdo Station, February 2002. Engineers leveraged pack ice's formidable strength when they constructed Antarctica's first floating ice pier in 1973. Such ice piers are used during cargo operations to load and offload ships. Fleet operations personnel make the floating pier during the winter. They build upon naturally occurring frozen seawater in McMurdo Sound until the dock reaches a depth of about 22 feet. Ice piers have a lifespan of three to five years. Structures and ice sculptures are built out of large chunks of ice. The structures are mostly ornamental (as in the case with ice castles) and not practical for long-term habitation. Ice hotels exist on a seasonal basis in a few cold areas. Igloos are another example of a temporary structure, made primarily from blocks of packed snow. Ice can be used to start a fire by carving it into a lens that will focus sunlight onto kindling. If one waits long enough, a fire will start. Ice can also present a variety of hazards, especially for travel. For example, its formation on roads is a dangerous winter hazard. Black ice is very difficult to see because it lacks the expected glossy surface. Whenever there is freezing rain or snow that occurs at a temperature near the melting point, it is common for ice to build up on the windows of vehicles. Driving safely requires the removal of the ice build-up. Ice scrapers are tools designed to break the ice free and clear the windows, though removing the ice can be a long and labor-intensive process. Far enough below the freezing point, a thin layer of ice crystals can form on the inside surface of windows. This usually happens when a vehicle has been left alone after being driven for a while, but can happen while driving if the outside temperature is low enough. Moisture from the driver's breath is the source of water for the crystals. It is troublesome to remove this form of ice, so people often open their windows slightly when the vehicle is parked in order to let the moisture dissipate, and it is now common for cars to have rear-window defrosters to combat the problem. A similar problem can happen in homes, which is one reason why many colder regions require double-pane windows for insulation. For ships, ice presents two distinct hazards. Spray and freezing rain can produce an ice build-up on the superstructure of a vessel sufficient to make it unstable and to require the ice to be hacked off or melted with steam hoses. 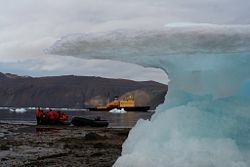 Also, large masses of ice floating in water (typically created when glaciers reach the sea) can be dangerous if struck by a ship when under way. These masses are called icebergs and have been responsible for the sinking of many ships - a notable example being the Titanic. For harbors near the poles, being ice-free is an important advantage, ideally all-year round. Examples are Murmansk (Russia), Petsamo (Russia, formerly Finland) and Vardø (Norway). Harbors that are not ice-free are opened up using icebreakers. For aircraft, ice can cause a number of dangers. As an aircraft climbs, it passes through air layers of different temperature and humidity, some of which may be conducive to ice formation. If ice forms on the wings or control surfaces, this may adversely affect the flying qualities of the aircraft. During the first non-stop flight of the Atlantic, the British aviators Captain John Alcock and Lieutenant Arthur Whitten Brown encountered such icing conditions - heroically, Brown left the cockpit and climbed onto the wing several times to remove ice which was covering the engine air intakes of the Vickers Vimy aircraft they were flying. A particular icing vulnerability associated with reciprocating internal combustion engines is the carburettor. As air is sucked through the carburettor into the engine the local air pressure is lowered, which causes adiabatic cooling. So, in humid close-to-freezing conditions, the carburettor will be colder and tend to ice up. This will block the supply of air to the engine, and cause it to fail. Modern aircraft reciprocating engines are provided with carburettor air intake heaters for this reason. Jet engines do not experience the problem. Ice pier during 1983 cargo operations. McMurdo Station, Antarctica. A glass of iced water. Ice on a fence, frozen during winter. Icicles forming on a cabin's roof at Dinner Plain Australia. Icicles at Big White Ski Resort, Canada. An ancient ice house (yakhchal) in Kerman, Iran, built during the Middle Ages for storing harvested ice. Feather ice on the plateau near Alta, Norway. The crystals form at temperatures below −30°C (i.e. −22°F). Parameter to measure the size of a sea ice floe. ↑ H. Iglev, M. Schmeisser, K. Simeonidis, A. Thaller and A. Laubereau. 2006. Ultrafast superheating and melting of bulk ice. Nature 439: 183-186. Retrieved November 10, 2007. ↑ Kenneth Chang. 2006. Explaining Ice: The Answers Are Slippery. New York Times: Science Retrieved November 10, 2007. ↑ Water has several triple points, as noted in the article Water. ↑ Kenneth Chang. 2004. Astronomers Contemplate Icy Volcanoes in Far Places. New York Times: Science December 9, 2004. Retrieved November 10, 2007. Gosnell, Mariana. 2005. Ice: The Nature, the History, and the Uses of an Astonishing Substance. New York: Knopf. ISBN 0679426086. Imbrie, John, and Katherine Palmer Imbrie. 2005. Ice Ages: Solving the Mystery. Cambridge, MA: Harvard University Press. ISBN 0674440757. Kuhs, Werner F. 2007. Physics and Chemistry of Ice. Proceedings of the 11th International Conference on the Physics and Chemistry of Ice. Cambridge, UK: Royal Society of Chemistry. ISBN 9780854043507. Macdougall, Doug. 2004. Frozen Earth: The Once and Future Story of Ice Ages. Berkeley: University of California Press. ISBN 0520248244. Petrenko, Victor F., and Robert W. Whitworth. 2002. Physics of Ice. Oxford: Oxford University Press. ISBN 0198518943. Prudden, T. Mitchell. 2007. Drinking-Water and Ice Supplies and Their Relations to Health and Disease. Fork Press. ISBN 9781406784374. Thomas, David N., and Gerhard Dieckmann. 2003. Sea Ice: An Introduction to Its Physics, Chemistry, Biology, and Geology. Oxford, UK: Blackwell Science. ISBN 0632058080. MinDat.org listing and location data for Ice. Dave Touretzky The physics of ice. Joe Wolfe 'Unfreezable' water, 'bound water' and water of hydration. Department of Physics, University of New South Wales. PhysOrg.com Sandia's Z machine creates ice in nanoseconds. Source: Sandia National Laboratories. This page was last modified on 25 January 2018, at 15:29.